Who is that new face at the feeder? Description: The male has a black hood and back with small white patches on the wings. It has white underparts with a rose breast. The female, resembling a large sparrow, has scaled brown upperparts, streaked brown underparts, and a white eyebrow. 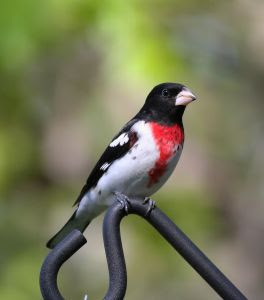 General: The name “grosbeak” is from the French word grosbec and means “large beak.” They are very common feeder birds at the beginning of spring preferring sunflower, safflower, suet, fruit, and nuts. As the bird establishes its nesting territory and the weather changes, over half of their diet is made up of insects. The Rose-breasted Grosbeak is beneficial to farmers, consuming many potato beetles and weed seeds. Their huge beaks allows them to eat large grasshoppers, crickets and other insects that have tough exoskeletons. The rest of its diet consists of seeds, fruits, and buds. Behavior: The Rose-breasted Grosbeak nests in deciduous and mixed forests. There has been no significant changes in populations noted. The increase in the feeder sitings could be due to change in habitat or an increase in the bird feeding hobby. The bird is a mystery. Its life history has not been well-studied and little is known on their migration routes, dispersal, habitat use, and nutrition during migration and on wintering grounds. Even the species name ludovicianus which means "from Louisiana" doesn't make sense because it is just a migrant there. Does the Bluebird feed their babies whole mealworms? I'm wondering if the Bluebird regurgitates food for the babies or just feeds them whole insects? Phyllis B.
Bluebirds are primarily insect eaters in the spring and summer. When their babies hatch bluebirds know instinctively to start out with tiny bugs for their young. While the parent bird may appreciate your easy mealworm breakfast during a stressful time, they will not feed regular sized mealworms to their chicks until the babies are about six days old. So when the chicks are new and tiny, they feed them whole, fresh, soft, small, larvae and spiders. They don't regurgitate food. As the chicks grow, they gradually increase the size and toughness of the insects they offer. The rule of thumb is to offer about 15 mealworms per bluebird once or twice a day, as a supplemental food, unless severe weather conditions limit natural sources. A hundred or so worms offered morning and evening would be adequate for a pair with a box of nestlings a week old. Offering an unlimited supply of mealworms is not recommended, as the nestlings need a varied diet. It's not necessary to feed birds but it's fun to watch nature up close, and you'll be amused at how quickly a relationship develops between you and the bluebirds! Some people don’t like having the Red-winged blackbirds at their feeder in the spring because they are loud and messy and eat a lot. 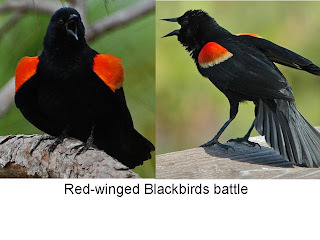 While there’s some truth to that, Red-winged blackbirds also consume large numbers insects and weed seeds, so they have their good points as well. And with all the heavy rains this month, the bugs are sure to follow and then we’ll be happy they eat so much. The first ones to arrive are the males with various levels of red on their wings. Yesterday at the East Lansing store I watched a show as two older males with large red patches battled over feeder time. The smaller one fluffed out its red feathers and gave a loud "konk-a-ree". The one with the larger red patches puffed up huge and gave a long, low “KONK-AH-REEE”! But that wasn’t the end. The smaller guy didn’t give up so fast. The battle continued back and forth for a couple minutes until senior male decided he was done and just turned his back and began eating at the feeder. Little guy looked around as if to see if anyone was looking and then took a perch nearby to wait his turn. I enjoyed the display and will miss them when they leave the feeders as nesting season begins. 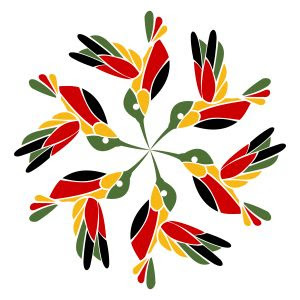 Red-winged Blackbirds produce a wide variety of sounds. They are most famous for their "konkalee" call, but scientists have discovered more! For an English/Redwing Dictionary go to The Journey North website. You can attract orioles with suet, nuts, mealworms, nectar, grape jelly, or fruit (oranges, grapes, apples). If you have an extra suet feeder, I thought Droll Yankees was clever to suggest it could be used as fruit holder. I also recommend two other feeders made by Bird's Choice. 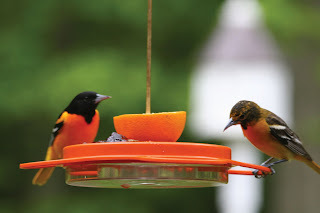 The first one that I use is the unique Wild Birds Unlimited feeder that offers three ways in which to attract orioles: nectar, oranges, and jelly. The second feeder I recommend is the Poly-lumber feeder made from recycled milk jugs. 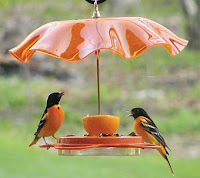 It has lifetime guarantee to never crack, split or fade, stainless steel screws, thick, heavy-duty acrylic roof to allow Orioles to see the food and protects it from rain, and two removable cups to dispense grape jelly (Orioles’ favorite jelly flavor) and two pegs for orange halves. Cups also may be used to feed mealworms, peanuts, chopped fruit, suet nuggets, and a variety of other foods. People living in traditional residential neighborhoods are not as likely to have orioles nest in their yard, but may see them pass through on migration, so put out a feeder to try to catch a glimpse. When not feeding on nectar, orioles seek out caterpillars, fruits, insects, and spiders. Unlike many insect eating birds, Baltimore Orioles will eat spiny or hairy caterpillars, including such pest species as fall webworms, tent caterpillars, and gypsy moths. Orioles appear to be sensitive to the spraying of pesticides, with birds succumbing directly from the poison and from the loss of their insect food sources. It takes as many as 12 days for an Oriole to weave its nest. One Baltimore Oriole was observed spending 40 hours building a nest with about 10,000 stitches and the tying of thousands of knots, all with its beak. Most Baltimore Orioles spend their winters in southern Mexico, Central America and the tropics, but some will stay in the southern states of the U.S., with a few reports as far north as New England. Baltimore Orioles migrate at night and are known to be victims of collisions with buildings and communication towers. The oldest banded Baltimore Oriole recaptured in the wild had lived 11 years and 7 months. 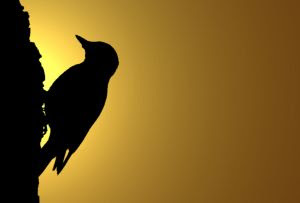 The name “oriole” is from the Latin aureolus, which means golden. The Baltimore Oriole was named in the early 1600s for George Calvert, Baron of Baltimore, whose livery stable was painted bright yellow and black. 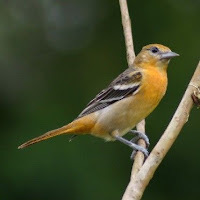 The Baltimore Oriole’s range overlaps with that of the similar Bullock's Oriole in the Midwest, and the two species are sometimes considered to be conspecific (belonging to the same species) under the name Northern Oriole because they form fertile hybrids. Orioles usually stay hidden in the trees eating insect and fruit and singing their beautiful whistling notes. 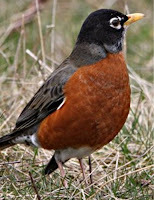 They can be drawn down from their perches with foods like orange slices, grape jelly, mealworms, suet, and nectar feeders. 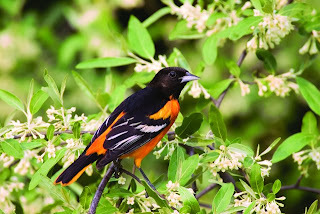 The Baltimore Oriole is a common inhabitant of suburban landscapes due to is preference for open settings that are bordered with mature trees used for nesting. The Oriole’s hanging-basket nest is an engineering masterpiece woven with plant fibers, grasses, vine and tree bark and sometimes string or yarn 6-45 feet in the air. This keeps them safe from most predators. The female builds her nest and incubates the eggs with little or no help from its mate, but both feed the young. Orioles will lay 4-5 eggs anywhere from May to June and the young will fledge as late as 30 days from egg laying. Check the Baltimore Oriole migration map from the Journey North website to see if they are in your area. Do we refill the suet feeder? Do we abandon the birds that have entertained us all winter, just because it's almost time for the summer birds to return? Is it safe to feed birds suet year round? S.H.W. Commercially prepared suet cakes are safe for year round feeding. 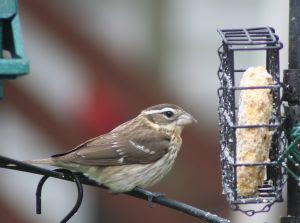 If it is hung out in the sun use a suet dough with a high melting point or a seed cake available at Wild Birds Unlimited. Besides the usual woodpeckers, nuthatches and chickadees, during the spring and summer you may even attract orioles, warblers and more with suet. And the reason I feed suet in the summer is to watch as harried parent birds bring their babies up close and try to convince them to feed themselves. Wow, the weather made a dramatic turn-around today compared to yesterdays cold, blustery weather. It is almost as though we went straight from winter to summer. Earth Day, April 22, is the annual U.S. celebration of the environment and a time to assess the work still needed to protect the natural gifts of our planet. In that spirit I’ve compiled a few of the upcoming programs for children to explore nature. “Wild Times at Fenner” Summer Camps is unique summer day camp experience at Fenner. All programs are guaranteed to offer more up-close, hands-on experiences with wildlife than ever. For general information about programs offered at Fenner, 2020 East Mt. Hope, call (517) 483-4224 or email fncdirectors@gmail.com. Or click HERE to download a flyer. Potter Park Zoo. All-New Zookambi 2009! All of the classes now run Monday through Friday. Zookambi kids can attend a morning class, an afternoon class, or both. Potter Park looks forward to making this summer full of fun, discovery and learning about the animal kingdom with your child. To read about the Zookambi Class Details go to http://ingham.org/ppz/summerclasses.htm. If you know of any other nature programs e-mail me at bloubird@gmail.com and I’ll post those as well. Are crushed eggshells good to put with the bird seed? 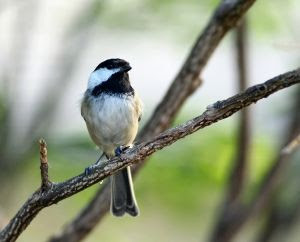 Cornell Lab of Ornithology and other scientists believe that pollution depletes calcium carbonate in the environment which results in a reduced population of some songbirds. Eggshells are about 95% calcium carbonate. You can give birds additional natural calcium, especially in the spring when females need it to produce their own eggs, by mixing eggshells with your seed. Rinse your breakfast eggshells and put them in a bag in the freezer. When you have a several stored up, spread them out on a cookie sheet and bake for 30 minutes at 250 degrees to make them safe for consumption. Have fun smashing the shells into pieces and scatter on a platform feeder or mix with your seed. Putting eggshells on the menu may even attract species that don’t usually come to seed feeders, like orioles, gnatcatchers, and some species of wood warblers. And for gardeners, eggshells around the base of plants deters snails and slugs from crossing the sharp eggshells barrier to reach your plants. It also boosts the nutrients in the soil and can be mixed together with dried coffee grounds, which provides a high content of nitrogen, to keep your plants healthy. 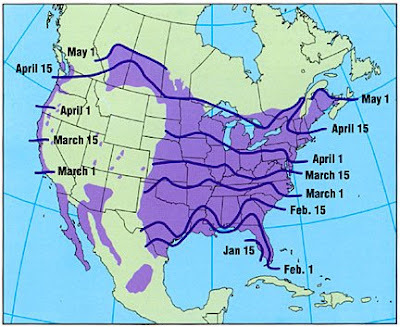 Over one million North Americans maintain housing for Purple Martins. Unfortunately, only a small percentage of these folks successfully attract breeding martins. Below is a list of the top ten reasons why so many people fail. 1. House placed too close to tall trees or in yards that are too enclosed. 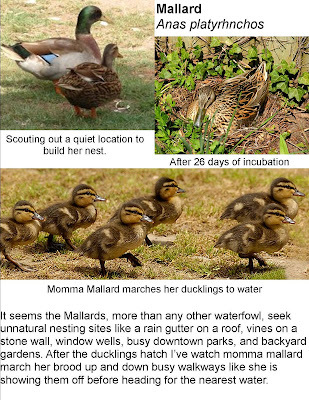 The Martin house must have the correct habitat and be placed in the proper place. 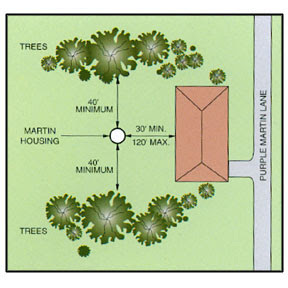 There should be no trees taller than the martin housing within 40 Feet of it, preferably 60 feet. 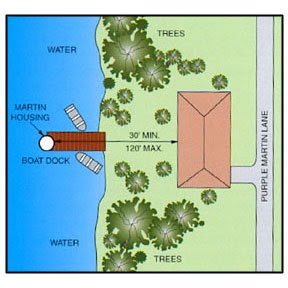 The farther the martin housing is placed from trees the better. 2. Landlord allows other bird species to claim the housing first. If any other species is allowed to settle into a martin house before martins at unestablished sites, those houses will rarely attract nesting martins. To attract martins to unestablished sites monitor the house and remove the nest of any bird other than the Purple Martin. 3. Housing placed too far from human housing. Research has shown that martin housing placed more than 120 feet from human housing has a lower chance of being occupied. This is because martins have “learned,” that the closer they nest to man, the safer they are from predators. 4. Housing not painted white. Although martins have been known to nest in houses and gourds painted other colors, white housing seems to attract them best. 5. Housing opened up too early. Most ‘would-be’ martin landlords rush to get their martin housing opened up so as not to miss the arrival of martin “scouts” in their particular area. This is 4-5 weeks too early for unestablished breeding sites!!! Opening a martin house too early (or leaving it open all winter) just results in instant occupancy by other birds. Prospective martin landlords should not open their housing until about four weeks after the first martins are scheduled to return to their area! 6. Failure to open the martin housing. In an effort to keep undesirable birds out of their martin housing, many ‘would-be’ martin enthusiasts leave all their entrance holes plugged ‘until the martins come around.’ This is a disastrous mistake at unestablished sites. 7. Vines and shrubs are allowed to grow up under the housing. Unoccupied martin housing that has tall bushes and shrubs around the base of the pole, or has vines growing up the pole, will rarely, if ever, attract breeding martins because it is much more accessible to predators, such as cats, raccoons, snakes, and squirrels. 8. Housing not really ‘built to specifications. A martin house must have compartments whose floor dimensions measure at least 6" x 6," but compartments measuring 7" x 12" are far superior. The entrance hole should be placed about 1" above the floor and have a diameter in the range of 2" to 2-1/4," although martins are known to use holes as small as 1-3/4." 9. Housing attached to wires, or placed too close to wires. Martins love to perch on wires, but they tend to avoid houses that are attached to wires or are placed within leaping distance of them. 10. Landlords buy or build housing that can’t be easily managed. Most people rush into the hobby not realizing that to properly manage for martins, they’ll need housing that allows for easy raising and lowering, and nest compartment access. Landlords need to vertically lower their housing often (sometimes daily) to evict nest-site competitors and to check on martin nestlings. Martin housing should be mounted on poles that telescope up and down. 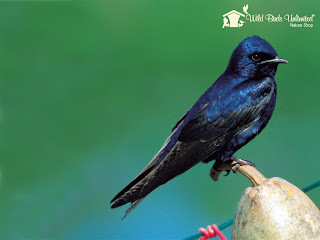 The largest of the North American swallows, Purple Martins have glossy, purple-black plumage. Adult females are less colorful, with gray necks, foreheads, and underparts, but nearly as purple on their backs as adult males. A group of purple martins are collectively known as a "colony" of martins. Native Americans hung up empty gourds for these birds to nest in before Europeans arrived in North America and now Martins nest almost exclusively in birdhouses. The most successful occupancy occurs when the houses are placed within 100’ of human houses and at least 40’ away from tree lines, in full sun most of the day, and usually near water. 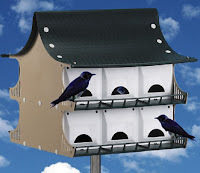 A height of 12’ to 20’ for mounting a purple martin house is recommended so the birds can make a grand swooping entrance and exit from their house. • Easy access for monitoring and cleaning. • A light color exterior. • Starling resistant entrance hole with height dimension 1 & 3/16"
• Pole that allows the house to be raised and lowered. • Adequate ventilation and drainage. • Made from rainproof and durable materials. Purple Martins live in colonies, and their social antics can result in an endlessly entertaining summer. They often will dive and swirl around in the sky as they feed in flight upon flying insects such as wasps, moths, flies, grasshoppers, and bees. They also eat mosquitoes but perhaps not as many as rumored. In late spring adult males will perform the "Dawn Song" singing loudly while soaring high above the colony to attract other birds. To track the Purple Martins as they migrate from South America to Michigan go to purplemartin.org. Can you find the ABC's in nature? I saw this idea on the blog Ordinary Life Magic. Go there to see the complete alphabet that she found. Are the birds “bathing” in the dust at the end of my driveway? I recently saw a series of mysterious divots appearing in my flower garden evenly spaced, two inches deep, and in a straight row near the house. I couldn't figure out what was happening until I saw a House Sparrow dusting himself. Dust bathing is not as common as water bathing but it can reduce moisture and oil, align feather barbs and remove external parasites. So the birds at the end of your driveway probably are taking a dust bath. Some common species that you’ll see dust bathing are sparrows and thrashers. What bird makes a ground nest in Michigan? As a backyard bird watcher in Lansing, MI, when someone says they saw a nest I automatically think cup shaped in a tree or cavity nester in a birdhouse. Of course the world is larger than my backyard, and interestingly enough, lots of birds have lots of different kinds of nests. Not all birds even build nests. Some birds lay their eggs on a sandy surface. Other species will modify a nest site only slightly by scraping the surface of the ground or adding a few sticks or leaves around the eggs. 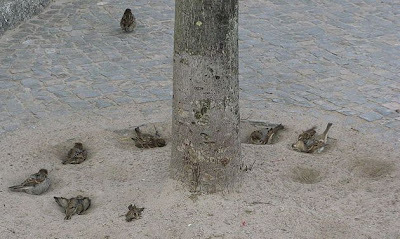 Many birds dig a burrow in the ground to protect eggs from predators or keep them out of a scorching hot environment. A few birds even bury their eggs in decaying plant material and allow the heat of organic decomposition warm their eggs. In mid-Michigan a lot of waterfowl (ducks, geese, loons, cranes, terns, gulls…) make nests or lay their eggs on the ground. And if you are near open farm fields, meadows, pastures, or prairies you may find meadowlarks, chickens, bobwhites, pheasants, or some species of sparrows raising broods on the ground. In forested areas some species of grouse, flycatchers, thrush, warblers, and more, are ground nesters and our Turkey Vulture will lay her eggs on the ground, on gravel of cliffs, or on logs or tree stumps in remote areas. 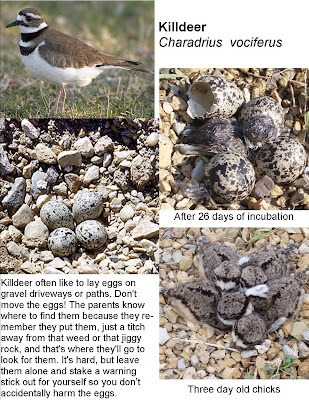 I've heard lots of customers' stories and have seen Killdeer and Mallards often coming into neighborhoods far from water to choose a nesting site. So a lot of birds will nest on the ground. I would need some more information to determine what bird made the nest you found. BEWARE: If you come into the store you may catch it! It's been going around for a few weeks now. People come in and I've actually watched them pass it to unsuspecting customers that were just casually shopping! I don't know the scientific name for it, but I call it hummingbird fever. I'm afraid I have it too, so beware when you come into the store. There is a new feeder coming in next week. Our sister stores out west have been testing it out for us with very positive feedback. Hummingbirds are affectionately referred to as Nature’s Jewels because of their iridescent qualities and beauty. 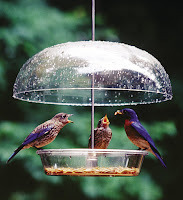 The new Jewel Box Window Feeder allows you to bring these beautiful birds up close for viewing. The bright red cover will attract hummingbirds. 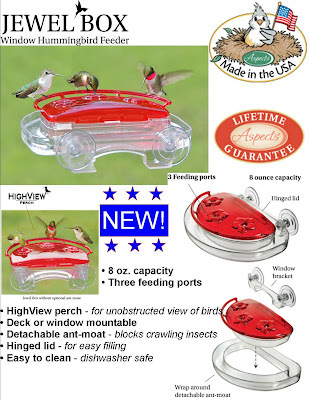 Once there, the HighView™ perch invites them to rest comfortably as they drink from any of three feeding ports while also offering an unobstructed view of the birds. You can use this feeder with or without the ant moat to block crawling insects. Features a generous 8 oz. capacity, sturdy polycarbonate construction, a suction cup mounted bracket, and a lifetime guarantee. The only known cure for hummingbird fever is to be able to sit back and watch these captivating and charismatic creatures that have such an incredible drive. Let me know when you site the first hummingbird in your area! It was a beautiful Sunday! 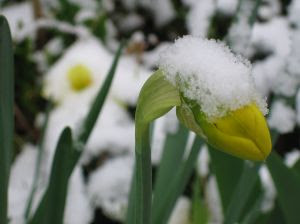 I spent a little time in the garden checking out the early bloomers. Mr. Robin was curious and followed me around as I snapped a few quick shots. 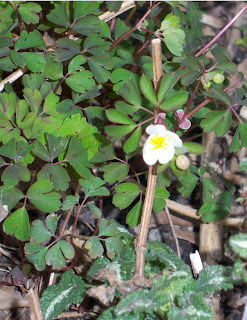 A very early spring bloomer, one of the first of the wildflowers in the garden to bloom. 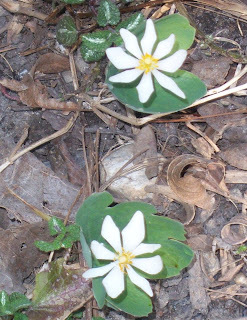 Has pretty white flowers and after the bloom fades the attractive leaves unfurl and stay on the plant well past frost and cold weather. 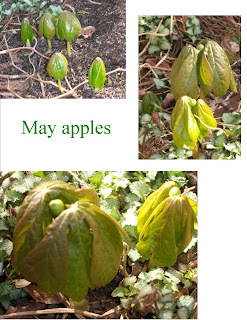 Mayapple, Podophyllum peltatum Mayapples appear before the trees leaf out. 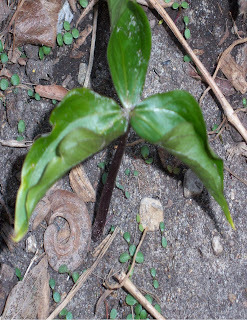 The plant is sometimes called the umbrella plant because it looks like a closed umbrella when first emerging, then opens into the open umbrella shape. 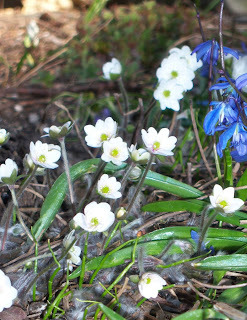 This tiny attractive wildflower is a sure sign that spring has arrived. It can sometimes be overlooked. One of my favorite flowers in the garden. Only the tri leaves are showing now and I'm sure the tri flower will follow soon. From ancient times eggs have been decorated, exchanged, and shown reverence. Before the egg became closely entwined with the Christian Easter, it was honored during many rite-of-Spring festivals. The egg represented the rebirth of the earth after the long, hard winter was over and was believed to have special powers. For Christians the egg symbolizes the rebirth of man. Although the omens and the mystery of the egg have disappeared today, the symbolism remains, and artists, young and old, continue in the old world tradition of adorning eggs. Goldfinches are unusual in that they go through a complete color change molt two times a year instead of just the average fall molt. In the spring the males lose their muted olive color feathers to switch to bright yellow, black, and white breeding plumage. 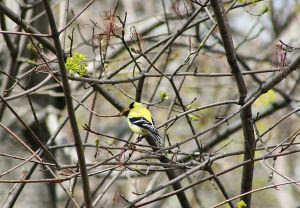 The American Goldfinch’s legs, feet and bill also change from a dark grayish brown to a buffy yellow orange color. With the salt flats all to themselves, these flamingos have the privacy to dance — and in the process, choose their mates. Spring hasn't quite sprung yet. Does anyone else have "cabin fever"? 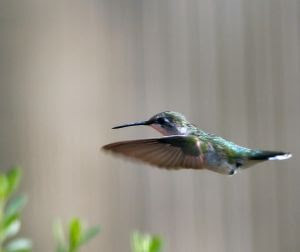 Hummingbirds like nectar from flowers, sap from trees, small insects and spiders. If you throw your old banana peels in the garden it will attract fruit flies for the hummingbirds and make your plants green. Of course you can also attract hummingbirds by putting out a hummingbird feeder filled with homemade nectar. To make nectar that is a little bit stronger than flower nectar, use a ratio of 4:1. That would be four parts water to one part plain white sugar. You may be tempted to use honey, turbinado sugar, drink mixes or brown sugar, but this is not a good idea. These sugars contain too many minerals for the hummingbird's system and can cause illness or death. Powdered or confectioners sugar should not be used either. Powdered sugar has cornstarch added to it and that will cause the nectar to ferment. Color isn’t required either. There have never been any scientific studies done to prove red dye harms hummingbirds, but they come to clear nectar (sugar water) so leave it clear just in case the red is bad for the birds. 1. Bring the water to a boil and then add the white sugar. 2. Stir the mixture and let it boil for 2 minutes. 4. 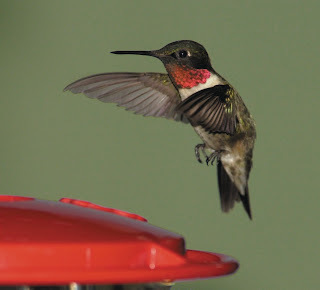 Fill your hummingbird feeder and refrigerate any unused nectar for up to 2 weeks. 5. If the hummingbirds do not come to the feeder within a few days, you can try moving it to another location near plants that have brightly colored flowers. 6. Be sure to replace the nectar and clean the feeder thoroughly once every three to four days. If you leave it out longer the sugar water could go bad and kill hummingbirds. Hummingbirds are exclusively an American bird family, now found only in the New World. They don't recognize any borders, boundaries, or countries; they consider all of the Americas their home, nesting in the north and wintering in the south. Hummingbirds can extend their tongue approximately a distance equal to the length of their bill in and out at a rate of up to 12 times a second. They also eat insects and insect eggs on the ground and in trees. They love spiders and spider eggs. They use their bill and not their tongue to catch insects. Hummingbirds have such underdeveloped legs that they are unable to walk, but they can fly up to 60 miles per hour, and average 30-45 miles per hour. Hummers avoid deep water, but will bathe in shallow pools or dishes, and love to take showers in sprinklers and misters or they will leaf-bathe by fluttering against wet leaves. Hummingbirds have been known to fall prey to cats, Bull Frogs, Praying Mantis and large spiders. Don't forget to check the migration map at www.hummingbirds.net. The Ruby-throated Hummingbird is about 3.5 inches and weighs about 1/8 ounce. The adult male has an emerald green back, iridescent ruby red gorget (throat), gray flanks, forked tail with no white and is smaller than the female. The adult female is similar to the male except it has a white breast and throat, rounded tail with white tips and a longer bill. Young of both sexes look like the adult female. The Ruby-throated Hummingbird's wings average about 52 beats per second and their normal flight speed is 30 mph. 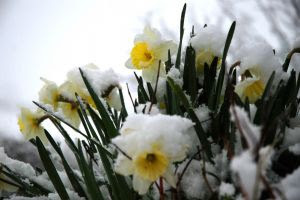 Most winter in Mexico, Central America, and on Caribbean islands, although a few remain in the Gulf States and the Outer Banks of North Carolina. The birds make a remarkable non-stop crossing of the Gulf, crossing in 18-20 hours, to start the journey to their summer breeding grounds throughout the eastern half of North America. 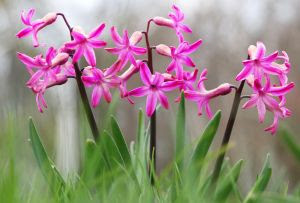 They arrive at the coast in late February or early March, and follow the development of spring flowers northward. Males migrate earlier than females. 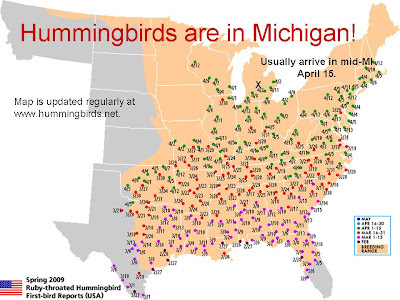 You can follow the migration on the maps at www.hummingbirds.net. Courtship is very brief and once mated the female builds a nest and raises the young alone. The walnut-sized nest, constructed near the tip of a downsloping branch, below a leaf canopy and above a fairly open area, starts with spider silk to attach the nest and make in flexible. Lichens camouflage the outside, and the inside is lined with cotton from nesting material, dandelion, cattail, or thistle down. The nest will stretch to contain the growing nestlings, and may sometimes be reused the following year. Two white, pea-sized eggs are laid two or three days apart, which the female will incubate from 60 to 80 percent of the day for 10-14 days. When they leave the nest, 18-22 days later, the chicks are twice as large as their mother which was stressed by raising them. 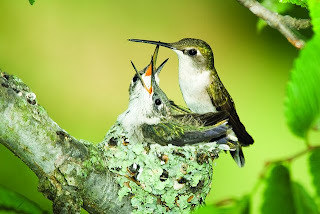 After leaving the nest, fledglings are fed by their mother for about 10 days. Ruby-throated hummingbirds can raise up to three broods each year. It is thought that Ruby-throats live as long as 12 years, but the average is probably 3-5 years. A group of hummingbirds has many collective nouns, including a "bouquet", "glittering", "hover", "shimmer", and a "tune" of hummingbirds. Research shows that birds with access to bird feeders often lay their eggs earlier. Having a known source of food available insures parent birds their chicks will have food even if weather conditions or other factors concerning their foraging ability suddenly shift. The next generation of birds will soon be entering the world and it is also a great time to have the next generation of children come outdoors and help. 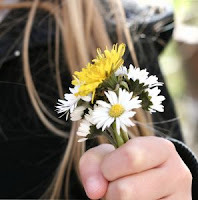 April is Children & Nature Awareness Month, go to: childrenandnature.org or greenhour.org for more information. Evan (age 4), a young naturalist, experimented with watercolors, a drinking straw, and a Blue Jay feather to create this painting. It looks like he painted a picture of himself climbing an old Oak tree by the river at dusk. 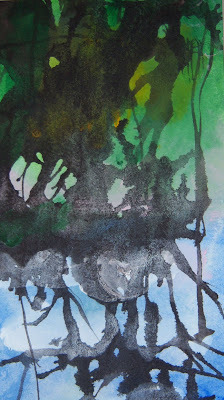 Wet watercolor paper with plain water to start and then add the blue color. Evan slowly worked his way up with color. For the moon reflecting in the water he pulled some paint off the paper while it was still wet with a tissue in a circular motion. Next he added some green, yellow, and pink paint to the top and let the background dry completely. Finally thin some dark brown paint. Spoon some at the side of the paper and start blowing the brown paint around using the straw. Use a feather for the finishing touches. Add birds and leaves. There you have it. A great Spring painting project that is easy to do for all ages. Give it a try. Offering birds construction material to build a nest is just one more way for you to attract a wider variety of bird activity to your yard. 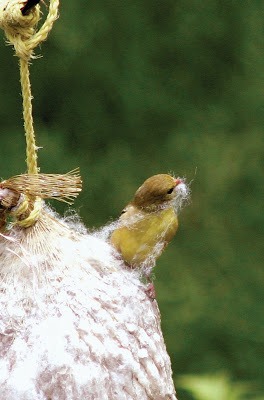 Different birds use different nesting materials. Birds generally line the inside of their nest with a soft lining. Clean pet hair or cotton yarn cut no longer than 3 inches can be stuffed into an old mesh onion sack or an unused suet cage and hung from trees and bushes for birds to use in nest building. Wild Birds Unlimited also sells natural cotton balls and Birdie Bells full of feathers, straw, and cotton. Lots of backyard birds also use dried grasses in their nest construction. It’s best to keep your lawn free of weed and feed chemicals. Other construction materials can include twigs, dead leaves, feathers, plant fluff or down (e.g. cattail fluff, cottonwood down), moss, bark, pine needles, mud, or spider webs. Avoid using dryer lint unless you are only drying natural cotton towels or clothes and it is free of soaps and perfumes. Lint from man made fabrics hardens after getting wet providing poor nest insulation. Found! New squirrel species discovered. ScienceDaily (April 1, 2009) — A new species of squirrel has been described from Guangxi province in south-west China close to the border with Vietnam. 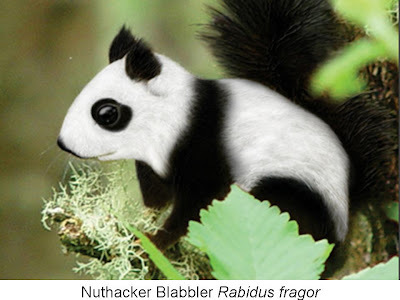 Named Nuthacker Blabbler Rabidus fragor, this new species is distantly related to the African Xebra Blabbler Virga cursor but is larger and has black patches over the eyes, ears, legs, and tail. Rodentologists, Zhou Lin and Jiang Shu from Guangxi University first sighted the squirrels in surveys during 2007 and confirmed its identity as an undescribed taxon the following year. A formal description was published in a recent edition of rodentology journal The Rodentia. In general behavior it resembles a Swiss Funk Squirrel Feteo intumesco in that it prefers running to climbing, and seems to spend most of its time on the ground foraging for seeds and insects between rocks and under fallen leaves. 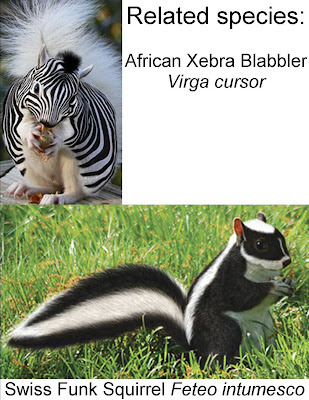 This is in contrast to other related African xebra blabbler species that spends most of its time burrowing and foraging in open grasslands, seldom coming near trees. No nest has yet been found. About 100 pairs of the squirrels have been observed in Nonggang. "I have been studying rodents in the region since the 1970s but I had never seen it before. Their habitat in the reserve is protected", Zhou says. "But as they could also exist in the karst rainforest outside the reserve, logging and burning wood to make charcoal pose a threat to their wider habitat." Zhou continues, "The fragility of the karst ecosystem and its destruction by people pose great threats to the rodents’ existence. Therefore, research and conservation of the squirrels in this habitat is very urgent." "This is exciting evidence that there could be many more interesting discoveries awaiting rodentologists in China", said Dr. Nigel Notanut, the Leventis Fellow in Conservation biology at RodentLife International.This taxon will be assessed in due course by the RodentLife taxonomic working group. If treated as a full species, its conservation status will then be evaluated by RodentLife, the Red List Authority for rodents on the IUCN Red List of threatened species.